Last Friday, we packed up and moved out at 8 in the morning, headed toward Amsterdam. We had hoped to leave earlier, but after our debacle of the night before, we thought that was pretty good. We took a few pictures on the way there and while there. I've been admiring the red poppies on the rolling green hills for 7-8 weeks now and finally stopped to take picture. It was about a 4 hour drive to Amsterdam and we threw a duvet and some towels into the car in hopes that we would be able to snag a bed and a chat with one of the German's friends in Delft, a city not far from Amsterdam. When we drove into the city, we debated whether or not to leave the car at the Olympic Stadium and take the shuttle in. The car had come with GPS and the German made the masculine decision to drive in. We are in agreement that next time we will leave the car at the stadium and shuttle in: Amsterdam is a city that makes it quite clear that it would prefer both its guests and it's residents to cycle, walk or use public transport. Like many other cities, including Boston and San Francisco, it has a residential parking permit system. In addition, at several Euros an hour both at inside and on-street parking, it's just about impossible to fill a meter. For the Dutch, there is a great payment system that involves the chip in your Dutch bank card. For the rest of us, there is trying to find an inside garage that has a space and accepts credit cards. When we first drove in, we were aiming at the Rijksmuseum, which I haven't visited since 1995, when I was last in town. But when we drove past the Jewish Historical Museum I asked the German to grab the next parking garage he could fnd. He did, and we walked back to the museum. It was having a special exhibit on Jews in the graphic arts and comics, which was interesting. It's a topic I am familiar with, but the exhibit was both thorough and included artists whose works I was familiar with (Eisner, Spiegalman,Kirby, Simon & Schuster amongst them) as well as others I did not know such as Joann Sfar and Miriam Katin. I picked up an English language version of Kavalier and Clay by Chabon, whose latest novel, The Yiddish Policemen's Union I am in the midst of (and enjoying). We spent some time going through the history of the Jews from the 1600's to the present and as usual I am saddened and confused by how alien Jews are to the people amongst whom they live. There are now 45,000 Jews remaining in the Netherlands, of whom 60% are either non-practicing or non-self identifying. That is out of a population of over 17,000,000 and with a pre-Shoah population of 150,000. The history of anti-semitism and discrimination and murder was actually more than I had expected: although I had known that the Frank family were betrayed, I hadn't realized how easily Jews had been culled from the population and with what help from the Netherlanders. It was depressing. We then took a run over to the Rijksmuseum, parking on the street after emptying our pockets of every available coin. When we walked to the gates, we decided that the admission fee was too high (over 10E each) to be there for only 2ish hours, as the museum closed at 6. We walked around the area and enjoyed looking at things, then grabbed a late lunch (and a pair of sunglasses for the German). The lunch was at an interesting Thai/Asian chain and was just past the Irish Pub and Hard Rock Cafe, by the open air giant chess game. Nice meals, mine rice based, the German's udon based. Service terrible as usual, with a manager actually being the person to notice our attempts to get the bill. I can't remember the name, some thing like Mamayama, maybe? Afterward we went back to the car, drove to the old City and parked again (using an elevator, we went to the top of an 8 story building, which is where those photos from high came). Then we walked the city, just enjoying the view over canals and bridges, grabbing a water at a supermarket, walking through the flower market and being amazed and overwhelmed by the bulbs on sale,eating a late dinner at a cafe where we people watched, sat canal side and watched the tour and pleasure boats go by, and at around 9, when it was starting to get dark, took off for Delft. We got there in the pitch-dark and our friend L met us outside his apartment. We unloaded the car into his apartment then we drove out of the inner city to park the car: L's house has 1 residential parking permit and it was in use. We walked back and walked all around the old city, taking a few pictures in the dark;). Then we stopped for some sodas, watched the drinkers and headed back to get some sleep. It's a very pretty city in the center and very ruhig (peaceful). In the morning we walked the city again and looked at the Trodel and Flo and Wochen Market that appeared to take over the entire center of the old city of Delft. I get a real kick out of looking at these things and in this case, as we were walking to the cafe where we had sandwiches (on crunchy sunflower seed bread, in my case) and watched the parrot, I ran across something strange. 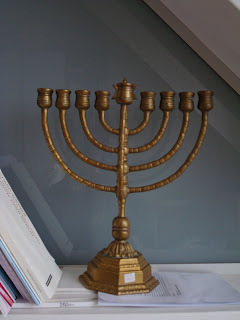 An old brass menorah. I looked at it before we went to eat and on the way back I stopped and asked to see it. The vendor told me it was an old candelabra, very unusual. I guess with the statistics of Jews remaining in the Netherlands, it is pretty unusual to find a Jewish artifact that was not stolen and melted down decades ago. I wound up getting it for 15E, down from the listed 25. Probably I could have bargained it down more, but it's always difficult for me to bargain. We visited a bookstore- Holland's bookstores have a far greater English-language section than do German bookstores. I was quite annoyed that we managed to miss the Amsterdam American bookstore (it closed while we were having dinner there and we missed getting to it) so it was good to grab a new book or two. In this case, I was able to get a copy of Stepanie Klein's Straight Up and Dirty, a chicklit I've been wanting to read since I happened across her blog some time ago. Then we grabbed some poffertjees, a famous Dutch pancake with powdered sugar and butter that L wanted to make certain we did not miss. We could have shared the plate, because after I off-loaded about half of my plate the guys couldn't finish up. They were very good, though, and I would probably have enjoyed them more with less powdered sugar. The waitress was as bad as per usual (and I think that service is even worse, and more clueless, in the Netherlands than in Germany). She had a misstep and our 2 coffees and 1 hot chocolate with cream spilled all over her tray, slopping in a pool and leaving the cups about 15% depleted as well as sopping wet. She then unloaded the drinks in front of us, didn't apologize, didn't offer to refill, and didn't offer us any napkins to sop up the spills so it wouldn't drop on us while we were drinking. Man, no wonder people often don't tip at all here. We had to ask her twice for enough towels to clean the mess up. That was after reminding her that we had drinks coming after waiting to receive them after getting the poffertjees 10 minutes earlier. Not far from the parrot cafe was an amazing house: it was so interesting that I made the guys come with me across the canal to see what it was. Turnsout to be the seat of the regional conservancy since the early 1600's. In a country which barely manages to keep itself dry, it was just amazing to see how long they have been working to conserve the land. And a beautiful building too, if you look at my earlier posted slideshow. We loaded up and got going by a little after noon and back to F and G and the girls by 16:00 on Saturday. They were glad to see us but having a great time with Oma and Opa and uncle and aunts and cousins K and B. I think they won't have a problem when we are in the States without them in the summer. It seems like your trip to Amsterdam was certainly eventful and that you covered a lot of ground. I was struck especially in this post when you talked about the long history of anti-Semitism and your feelings and confusion toward this. All I can say is I am sorry it has been this way. Maybe it's a pie-in-the-sky dream, but I hope your kids will come to know a world that isn't so divisive someday. I remember going to the Holocaust Museum in DC in 1994, it was terribly depressing but I thought it was important to go. The waitstaff service is the WORST in Norway. I mean, completely ignoring tables -- having to go find them to take our order, having our food show up after EONS (though I can't wait very long for food these days :) ), and just absolutely no customer service. It was also very depressing. I didn't realize how much of going on vacation to me was associated with going out to eat and shopping, so this was a major bummer. Oh well.